This cake is so ready for winter weather. Let’s be real, we all want comfort food in the winter. So how did I come up with this recipe? It all started in the morning when I saw two overly ripe bananas on my counter in the kitchen. Hmm, I thought what can I make with super ripe bananas that most of us would throw away. I love using ripe bananas in dessert recipes because I can cut back on the sweetener. So I thought ok what goes well with bananas. 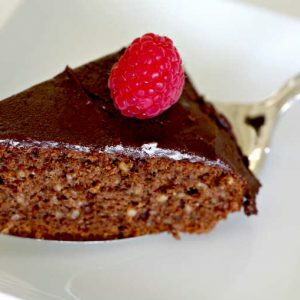 For me, it is chocolate and walnuts, two of my favourite ingredients in a cake. So I created this beautiful gluten-free and grain-free chocolate banana bundt cake. I added a little maple syrup for additional sweetness, pure cocoa and plenty of walnuts, the cake tastes almost like a brownie. Ok, the bundt cake was perfect. 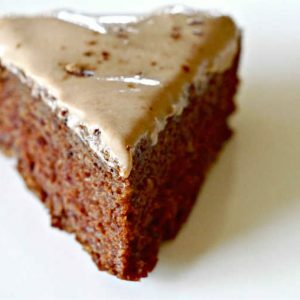 But I didn’t stop there because I wanted to make the cake extra special, so I added a coffee walnut glaze. 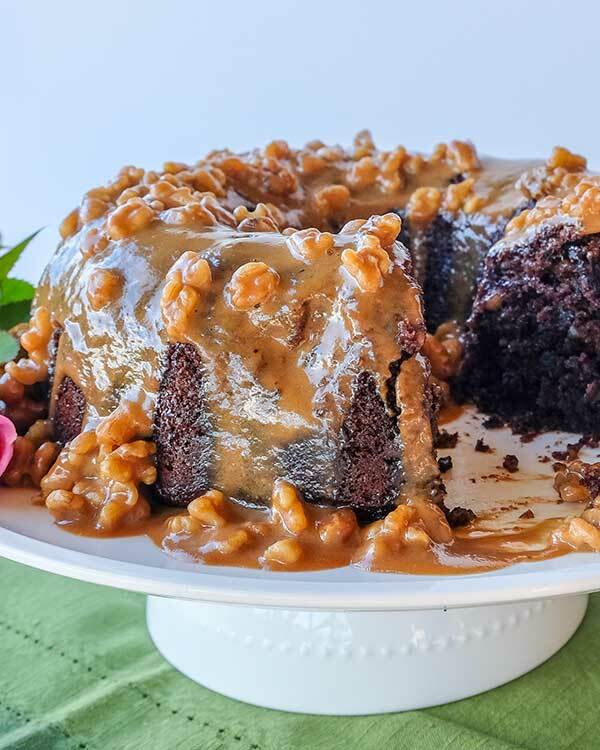 The glaze tastes like caramel coffee with walnuts it is so darn good and turns a simple bundt cake into the best coffee cake ever! While stirring, cook over medium heat until the glaze starts to thicken. Melt in the butter and stir in walnuts.